Right There in Your Home! You don't have to trust your prized fine rugs to a service that insists on taking your rugs with them to clean them off-site in some unknown shop. We'll clean them in the safety of your own home...you can even watch if you'd like! First, we'll inspect your rugs carefully and we'll check for any rips, tears, or damaged areas. After determining that the rug is synthetic, we'll further test to see if it is nylon, polyester, olefin, rayon, or something else. Then, we'll thoroughly vacuum the rug to remove as much soil as possible prior to introducing water. We'll apply a fabric-appropriate pre-conditioning agent to the rug. Depending on the size of the rug, we'll either use a hand-held brush or our carpet rake to agitate the rug. This helps the pre-conditioner to penetrate deep between the fibers. Now we steam clean the rug. Depending on the size and backing type, we'll either use our hand tool or our traditional cleaning wand. We'll inspect for any stains which did not respond to the cleaning and we'll treat them with the appropriate chemicals. We'll groom the rug to give it a uniformed appearance. 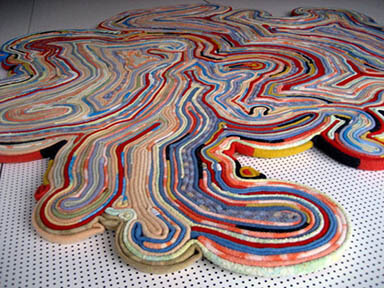 Lastly, the rug will be rolled up and set out of the way for it to dry. The process for natural fibers is fundamentally the same, just with specialty chemicals and a gentler cleaning procedure. After identifying the fiber type as natural, we further narrow the rug down as being wool, silk, cotton, natural velvet, or something else. We also inspect for any damage or tough stains. 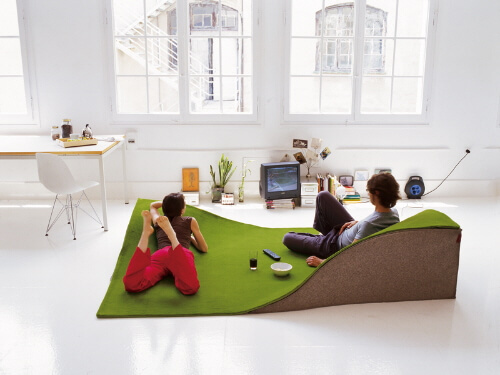 Depending on the resiliency of the rug, we'll vacuum it with or without the beater bar activated on our vacuum cleaner. We'll apply a very mild, natural fiber-safe shampoo or pre-treating agent. Using a horsehair brush or rake, we'll gently massage the cleaning product into the fibers. Using our hot water extraction system, we'll thoroughly clean the rug. Now we'll make sure each fiber is standing tall by making a pass or two with our carpet groomer. Finally we'll roll the rug up and set it out of the way so it can dry. *It should be noted that wool rugs have a 'wet dog' smell after they're cleaned. It's a good idea to keep wet wool rugs away from pets who may feel inclined to "mark their territory." You can expect your rugs to be dry usually between 30 minutes and 2 hours. Pricing for rug cleaning depends on fiber type, backing type, and size. 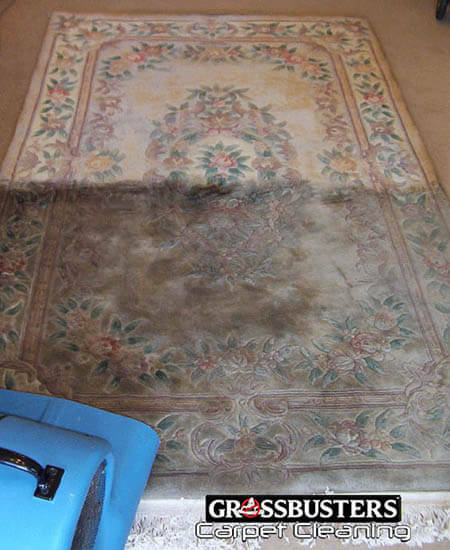 Call today for a FREE rug cleaning estimate! 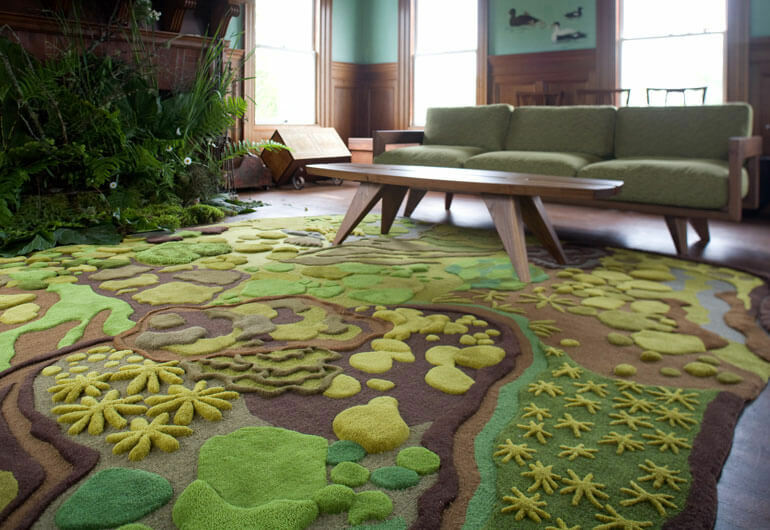 Below are some of the COOLEST rugs we've ever seen! Copyright ï¿½ 2012. All Rights Reserved.